As Sam Keitch enjoys the last weeks of his curatorial internship, he was called upon to create the latest addition to the Arboretum’s ephemeral art using dead or dying trees. Many may remember the “blue tree” created by another curatorial intern, Todd Rounsiville, out of a Maackia chinensis suffocated by construction compaction. Marty Long carved the intriguing Bender oak sculpture out of a dying Quercus x benderi. Fashioned in the same vicinity as Sam’s masterpiece, artist Patrick Dougherty shaped the ephemeral art sculpture “Abracadabra” on a dying Tilia ameicana. Sam’s recent creation is of a dying Quercus macrocarpa. This 10-year-old bur oak suffers from physiological problems with the roots. While we are not sure of the exact cause, it may include reasons like being planted too deeply or girdling of the roots. 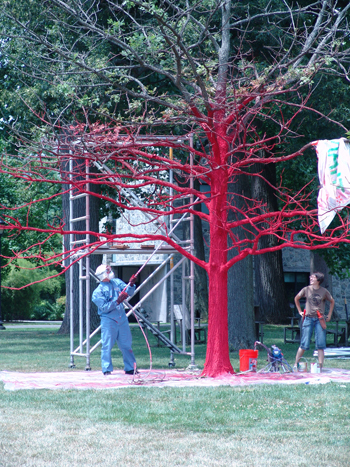 No matter the cause, as with other similar ephemeral art projects, the Arboretum saw this as an opportunity to draw attention to the loss of the tree and to amuse, excite, and create wonder in the community. 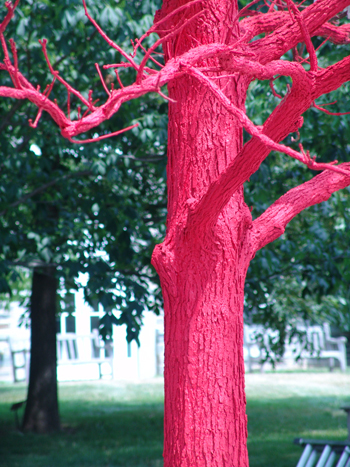 Titled “In the Shadow of Abracadabra,” Sam has sprayed this 30-foot tree “geranium red” using a power sprayer. It took him about two and half days to create this new icon in the landscape. See photos detailing his progress on our facebook page. Located in front of Trotter Hall, this red tree mimics colors in the Dean Bond Rose Garden and draws the eye of visitors to Parrish Hall, McCabe Library, and Trotter Hall. Because this work is located in the same vicinity of the Patrick Dougherty sculpture, “Abracadabra”, the title of “In the Shadow of Abracadabra” seemed appropriate. 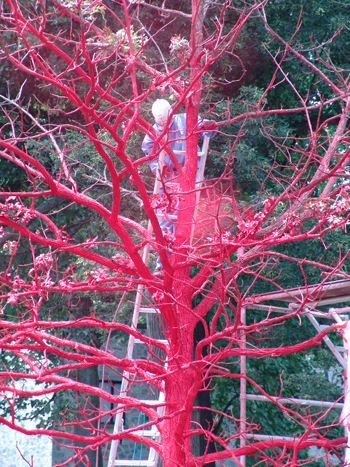 In our past experience, painted trees last from two to three years. This will give us all plenty of time to enjoy the piece in all the seasons. 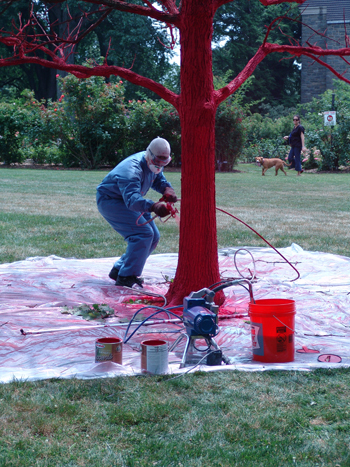 Stop by the Arboretum to see Sam’s last intern project and experience a red tree and red roses. What a great piece! And thanks for explaining its appearance in the landscape. The construction contractors working at Parrish Hall were scratching their heads and wondering what stray artist had wandered onto campus, and now they, and everyone else, can appreciate it more fully. Thanks! Thanks Jan. We hope to have some signage below the tree shortly as well. Thanks for sharing, Becky! I will take a walk this morning to see it!